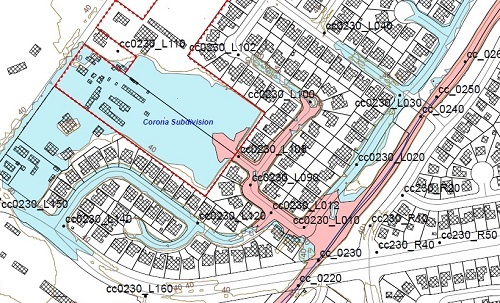 Corona Subdivision XP-Storm Evaluation (CA) | WEST Consultants, Inc.
WEST evaluated the hydraulic impact of the proposed Corona Subdivision, located between Corona Road and the intersection of Andover Way and Monica Way in Petaluma, CA. The City’s XP-Storm model was used for this evaluation. It was found that elevating the Corona Subdivision to remove it from the 100-year floodplain would increase the water surface elevation in adjacent residential areas. Therefore, a new detention basin just upstream of Riesling Road was planned to mitigate the lost floodplain storage due to development. The City’s XP-Storm model was modified to include nine additional nodes in the right overbank of Corona Creek; a new culvert at Wellington Place was added to the model along with a weir to account for overtopping flows; and a new pedestrian bridge upstream of Wellington Place was added to the model. The Riesling Road detention basin was modeled as an offline detention area, and it was recommended that the side flow weir from Corona Creek to the detention basin include an adjustable crest using stop logs or similar modular components at half foot increments to allow for plus or minus two feet of adjustments. This was recommended because the City’s XP-Storm model was based on a calibration that did not include any stream gages along Corona Creek. In addition, the cross section geometry just upstream of Riesling Road was based on less detailed topography. Model results indicate that without detention, the 100-year water surface elevation due to the Corona Subdivision would increase by up to 0.4 feet in the vicinity of the project, and downstream on the Petaluma River the peak discharge would increase by about 20 cfs, while the maximum water surface elevation would increase slightly. Due to these increases, a Riesling Road detention area was recommended. According to model results, the proposed Corona Subdivision project with the Riesling Road detention basin reduced water surface elevations below the existing elevations not only for the project site vicinity but also Corona Creek and the Petaluma River for both the 10- and 100-year events.